There's no avoiding this reality: when launching new products, brands often have to retire existing SKUs due to limited shelf space or restricted manufacturing capacity. Many employ industry rules-of-thumb to make these tough choices, resulting in suboptimal returns. What's the best approach to ensure maximum brand growth—and exactly how much more successful are brands who adopt it? A new Nielsen study has the answers. When choosing which products to retire, many brands rely on judgment or simply delist SKUs with the lowest sales velocity. However, this simplistic approach often leads to launches that don't grow the brand. What percentage of the time are the lowest-velocity SKUs NOT the least incremental? 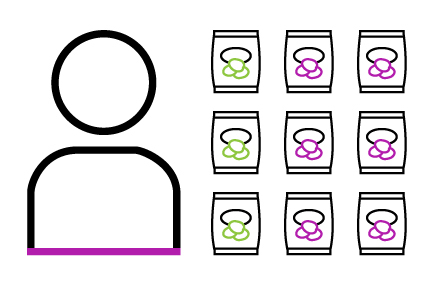 To complicate matters, brands often consider new product launches in isolation, without factoring in how the new items will interact with the overall portfolio. 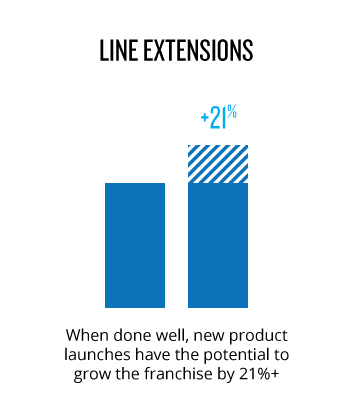 What percentage of line extension launches actually lead to a decrease in sales for the total brand? Beyond limiting growth, making suboptimal line choices can have other long-term consequences. How much can you increase your unit share when line extensions are optimized based on incrementality? A prominent snack food manufacturer was planning to launch four new SKUs to their line of premium crackers and needed to remove existing varieties to make room for the new SKUs. In this situation, the brand would typically remove the four SKUs with the lowest sales velocity—but some of these were actually the more incremental SKUs. In fact, they had used their typical rule-of-thumb, they would have delisted their third most incremental SKU! In reality, removing the lowest-velocity SKUs would have resulted in no growth whatsoever. A line optimization study revealed that replacing the SKUs ranked third, fourth, fifth and sixth for velocity would maximize sales and deliver an 8.4% lift in unit share. WANT TO MAXIMIZE YOUR BRAND GROWTH? With Nielsen's Line and Price Optimizer, you can identify the ideal combination of new and existing SKUs for your future line-up while factoring in the competitive reality. Line and Price Optimizer can be combined with our best-in-class forecasting capabilities to simulate complex, real-world scenarios such as alternate price-pack configurations and the impact of launching additional SKUs to another line in the portfolio. © 2019 The Nielsen Company (US), LLC. All Rights Reserved.